Get there at least an hour before they open. We went on a Saturday, got there about 45 minutes before they opened and had to wait a little under an hour after they opened to get in. Entrance fee is about 8 Euro. Wear comfy shoes because you will do a lot of walking through damp floors and corridors, and climb down a long spiral flight of stairs. Metro stop is Denfert-Rocherau. 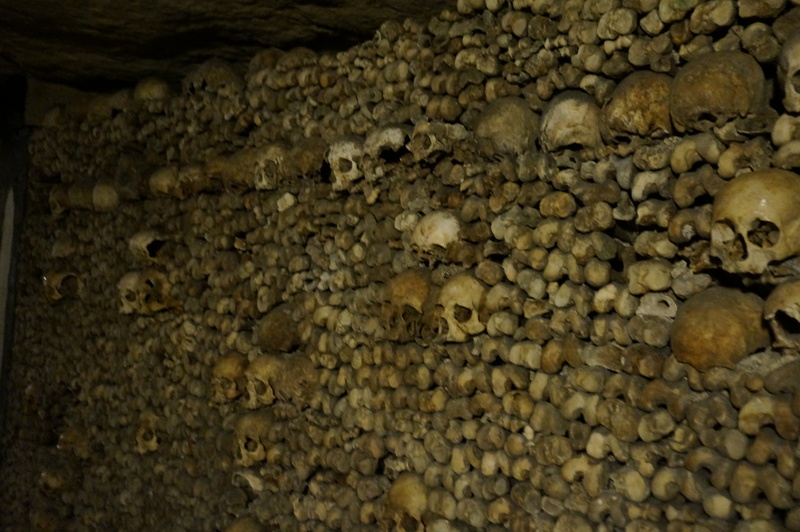 Once you get out of the metro, the entrance to the catacombs is across the street. There is a Paul (coffee, tea, sandwiches) semi-close by and also small convenience stores so if you’re like me and can’t get up early to save your life let alone eat breakfast, there is something available for food to eat while you wait in line. No bathrooms! So, make sure you can hold it for about an hour and a half to two hours. The indistinguishable skulls once belonging to real people that stared back at me, gently reminded me that death is a fate none of us will evade. Their remains rest there never to see the light of day again. They reminded me that I, on the other hand would emerge from the tunnels alive so I better make the most of the time I have. 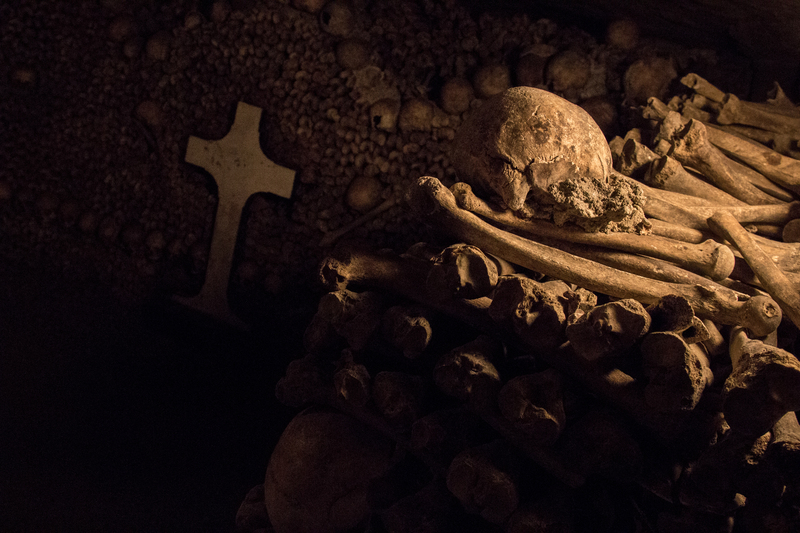 Click here for our video of our catacomb adventure! This is absolutely fantastic! Thank you for sharing! I sadly missed this when I went, Maybe ill go back for halloween. Spooky, but I’m guessing you weren’t allowed to touch any of the skulls?